Eltronicschool. - Proteus has launched their new or latest version that develop Proteus version 8.3 for Windows. This is Proteus version 8.4 for Windows to create electronic circuit and simulation using ISIS and create design PCB layout using ARES features in this proteus. 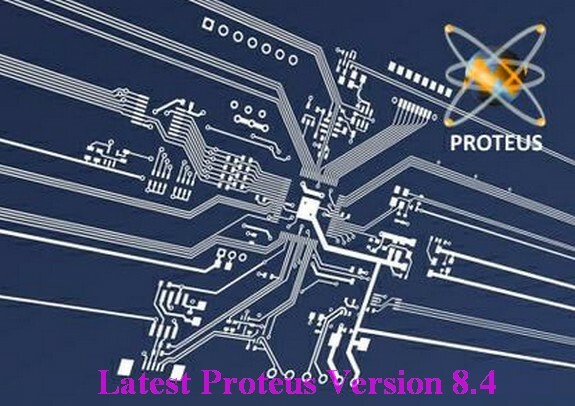 From Downtr site describe that Labcenter Electronics a leading developer of electronics CAD (schematic, simulation and PCB autorouting) software has released 8.4 version of Proteus, is the latest interim release of the Proteus Design Suite CAD Software. Proteus PCB design combines the schematic capture and ARES PCB layout programs to provide a powerful, integrated and easy to use suite of tools for professional PCB Design..
Official support for Windows 10. System wide update to support high dpi monitors. Addition of design rule aware curved tracking in the PCB Layout module. Improved power plane clearance from curved and mitered tracking. Enhanced BOM Reporting and Pick and Place output formats. Various compatibility improvements to DXF output. Completion of the MSP430G2x variants. Labcenter Electronics Ltd. was founded in 1988 by the chairman and chief software architect John Jameson. The initial launch of our Proteus design suite followed soon after and has since benefited from nearly 25 years continuous development, evolving into one of the most cost effective, fully featured EDA packages on the market. With current sales in over 50 countries spanning the globe Labcenter is continuously expanding both its product portfolio and its customer base. when I update, several resources among them the library were null, the demo mode was ok, what can it be? it's asking me for a password, did I do something wrong?